Better late than never, here are some of my personal musical highlights of 2009. Last year was all about the emergence of Glatze as a live music sensation. Well, I had my moments ;) My time in Birmingham led to some exciting new relationships. I played a variety of gigs as part of the underground experimental scene. Then, out of the blue, the delightful Capsule girls got in touch to ask whether I’d like to support Melt Banana. As they are one of my favourite bands, it was a no-brainer. I went on to play at Supersonic, which was amazing. I was also honoured to be chosen by Capsule to complete an alternative score for “There Are No Others, There Is Only Us”, which was shown at Moor Street Station, throughout Supersonic. 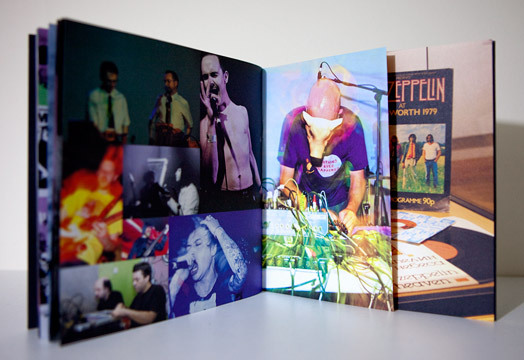 Then to top my “Year with Capsule” off, they included a photo of me in their 10th birthday programme – see below. I am most flattered! 2009 also saw me develop my midi-octopus, which I demonstrated at Futuresonic (Thanks to The Centrifuge for sorting this!). Production of my midi-octopus stalled a little in the latter months of 2009, to give me time to concentrate on my Glatze liveset, but it’s very much back on the agenda for this year.